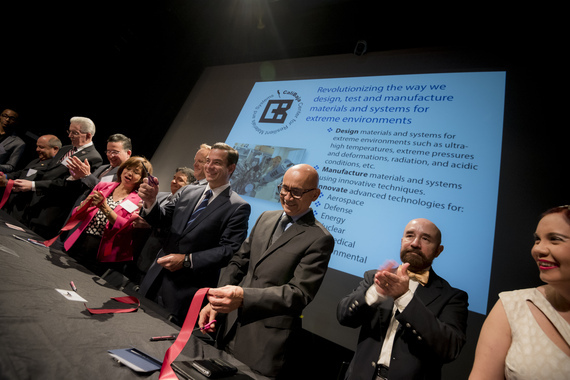 The opening of the new Cali-Baja Center for Resilient Materials and Systems at the University of California, San Diego (UCSD), on May 24, 2016, was expected to be perfunctory, but when Dr. Olivia Graeve, the new Center's first director, stepped to the podium, it all changed. "This center will be filled with the spirit of '¡Si, se puede!' It can be done!" Most in the audience likely expected an academic speech, heavy on technical descriptions of the organizations and programs on both sides of the U.S. Mexico border that will participate in the CaliBaja Center's collaboration, but what they heard came not from a script, but from her heart. The meeting started late because a concrete truck had tipped over, blocking Interstate 5, and causing guests from south of the border to be delayed more than an hour. Graeve used that delay as chance to gather her thoughts as the growing crowd enjoyed making new cross border connections over coffee, fruit and pastries. When most of the guests had arrived, Dr. Graeve began by explaining her family has roots on both sides of the border. "My great-great-grandmother was born in the Hacienda Santa María in Baja California Sur, my great-great grandfather was born in Ensenada in 1886, my grandfather was born in San Diego in 1917, and both my parents were born in Tijuana in 1947, and now three of my siblings join me in having one or more degrees from the University of California." "This region is my home, it is my family's home, it is the home of my friends," Graeve said, "This center will be filled with the spirit of '¡Si, se puede!' It can be done!" In developing the CaliBaja Center, Graeve called on her cross border roots: "my mother has always taught me about the importance of collaboration and of believing in each other to gain understanding," she said, an important element in the formation of this new binational research center. The Center has two primary goals in bringing together researchers and scholars. The first and most obvious one is to design materials and systems for extreme environments (ultra-high temperatures, extreme pressures and deformations, radiation, acidic conditions, etc.). However, the second goal might be more important: to explore the extreme social and economic contrasts found along the Tijuana-San Diego border, the busiest border in the world, a place where social extremes collide and converge to form a unique social fabric and an emerging bi-national identity. For U.S. General Consul William Ostick, who heads the State Department's Tijuana Consulate, the center represents one of many cross border initiatives "building mutual economic opportunities and delivering tangible economic benefits to the people of the Tijuana-San Diego metropolitan area and the CaliBaja region." He also understands the people part of the equation. The second goal might be more important: to explore the extreme social and economic contrasts found along the Tijuana-San Diego border, the busiest border in the world, a place where social extremes collide and converge to form a unique social fabric and an emerging bi-national identity. "Our ability to provide quality education and build a more competitive regional workforce will drive our economic prospects in the 21st century," Ostick said in his remarks. "To be successful today, workers need bilingual and cross-cultural skills. They also need the practical and theoretical know-how to lead our workforce." "Together we must develop a competitive cross border workforce," Ostick said. Olivia Graeve agrees: "one of the goals of the Center is to develop the 21th century engineer who crosses borders seamlessly and has a global world view." Paulo Carreño King, the Mexican Foreign Ministry's Undersecretary for North America, traveled from Mexico City to underscore the importance of the new Center. "With a population of 6.5 million, the CaliBaja region possesses the largest concentration of people along the U.S. Mexico border," he said. "It is strategically located to provide access to regional and global markets and houses one of the leading high technology hubs in the world for medical devices, automotive, aerospace, commercial, electronics and logistics clusters, as well as renewable energy, agribusiness and international trade industry." Like Ostick, Carreño King believes the CaliBaja Center will increase the competitiveness of the two countries with university and industry linkages. "It will carry out research activities and technology development along this dynamic border," he said. "It is important to expand collaboration in higher education, research and innovation to set the foundation for a competitive region of knowledge in the new global economy." "There is no question that the impact of working together across borders will have a tremendous impact on the economy of this region," Graeve said. Graeve says the CaliBaja Center will be "the first binational research center on the entire planet." It will include UCSD, the Baja California Center for Nanoscience and Nano Technology at the Universidad Nacional Autonoma de Mexico (UNAM), and the Center for Scientific Research and Higher Education of Ensenada (CICESE). "This center, to me, to us, is the future." "Cooperation through academic mobility and exchange programs exposes young people and researchers from both countries to new ideas, models and cultures, resulting in significant positive impact," said Undersecretary Carreño King. 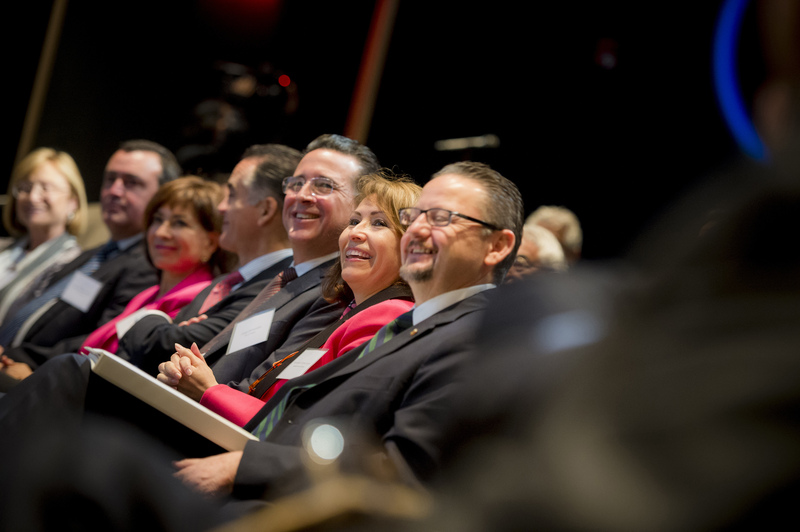 "The University of California's U.S.-Mexus initiative brings together existing bilateral programs and activities and stimulates the development of new partnerships involving academia, government, civil society and private citizens," Carreño King said. "It allows us to face common challenges in both Mexico and California such as education energy, environment, health, and culture. Like Graeve, Carreño King thinks the CaliBaja Center will be a model with heart. "This center is a great example for other regions to follow and replicate," he said. "This center, to me, to us, is the future."